Like all our prior poll posts, this post takes a moment to memorialize the results we recieved on the most recent blog poll. 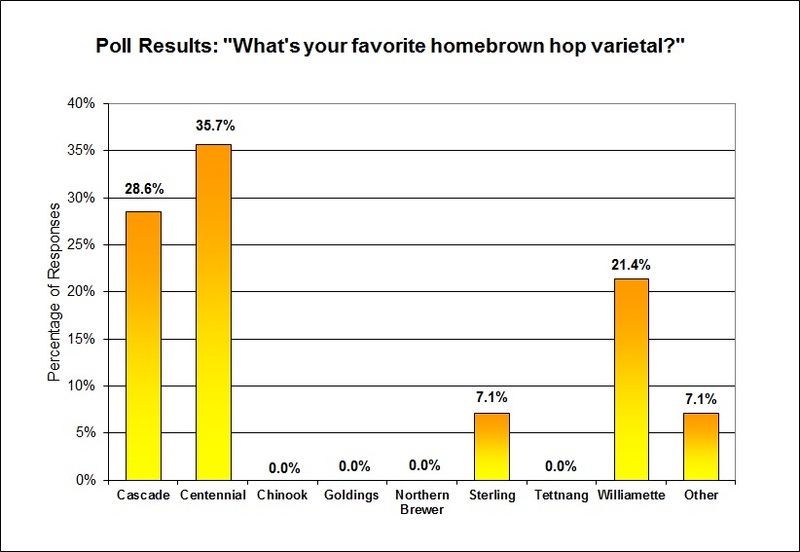 The readers' responses to the questions "Growing your own hops: what's your favorite varietal?" are presented below. I knew when I put this poll up that it was going to be a bit hit-or-miss with participation. The question is only applicable to those homebrewers (or brewers) who specifically have the land and interest in planting their own hops. The interest level has spiked up in a few years, but the number of homebrewers that put rhizomes in the ground is a small fraction of the population. Initially, the question was originally posted as a way to get suggestions about what type of hops I should plant. A few years back, I had purchased some rhizomes and planted them in pots at my old house, which did particularly well in their first season. However, the move to our new house and the lack of attention I was able to give them the first summer caused the plants to die off. But with the impending thaw coming (it is coming, right? ), I got interested again in trying it again. However, I ended up jumping the gun and purchased rhizomes (Sterling and Centenniel) before the poll could give me any suggestions on way or another. Oh well - if I had waited, I would have been the proud owner of Centenniel and Willamette hops, but Sterling will just have to do. Let us know if you've got hops in the ground at your home, and if so, what varieties? I'm sure I'll write a bit more about the new rhizomes and their progress in the future, but I'm curious to hear what everyone else has. And if you are reading this, our next blog poll is up and awaiting your participation. "When the pilgrims, seeking religious freedom, landed at Plymouth rock, the first permanent building put up was the brewery."